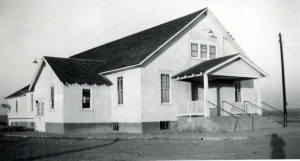 Emmanuel Mennonite Church (unaffiliated), located in Meade County, Kansas, five miles (eight km) south and four miles (6.5 km) east of the city of Meade, was organized 30 April 1944 as an independent church with 124 charter members, under the leadership of Henry R. Harms, who served as its first pastor, as a direct result of the dissolution of the Kleine Gemeinde congregation at Meade. One of the two church buildings formerly used by this group was enlarged to seat about 350, and was then used by the Emmanuel Mennonite Church. In the winter of 1952-53 the congregation built a new parsonage near the church. Samuel H. Epp, the pastor as of 1954, successor to H. R. Harms, served an average congregation of 230, the membership being 210. The deacons assisting the pastor were George J. Rempel and Peter L. Classen. In 2008 the pastor was Kenneth Harder. Epp, Samuel H. "Emmanuel Mennonite Church (Meade, Kansas, USA)." Global Anabaptist Mennonite Encyclopedia Online. 1956. Web. 22 Apr 2019. http://gameo.org/index.php?title=Emmanuel_Mennonite_Church_(Meade,_Kansas,_USA)&oldid=140019. Epp, Samuel H. (1956). Emmanuel Mennonite Church (Meade, Kansas, USA). Global Anabaptist Mennonite Encyclopedia Online. Retrieved 22 April 2019, from http://gameo.org/index.php?title=Emmanuel_Mennonite_Church_(Meade,_Kansas,_USA)&oldid=140019.